Hello and welcome to the One A Day competition for FEBRUARY. Regular runners will have a good idea of how this works already but for maiden runners and for those with plenty of experience please read on as there are a couple of subtle changes this month. If you know anyone interested in taking part or you've been a long time viewer of the forum who hasn't been inclined - for whatever reasons - to post much before please come and have a go, it's great fun, costs nothing and you can win real cash!! 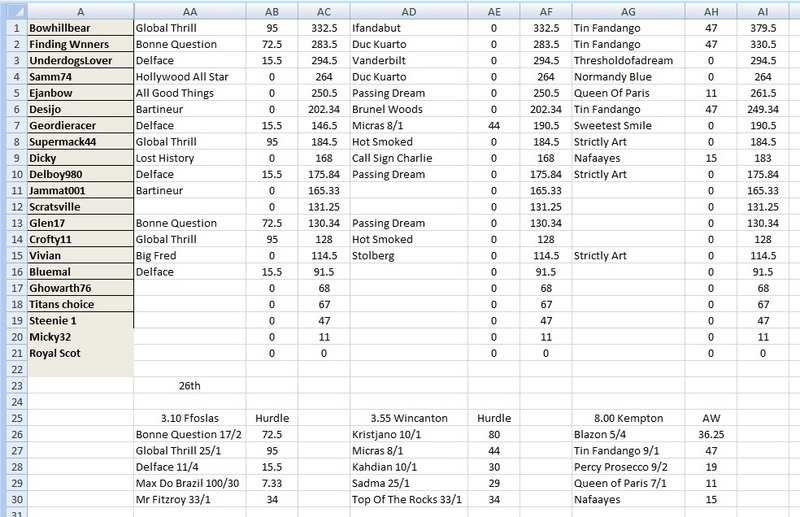 Take a look through previous month races/threads to see what's expected and how it works. Finally, I'll wish our runners the best of luck and I hope you'll take part and run hard but fair. Any questions, again, please ask in this thread or preferably, PM myself. Well done to Samm74 and newcomer Desjo on shooting out of the stalls scoring on all three days and in the 100 + points already. 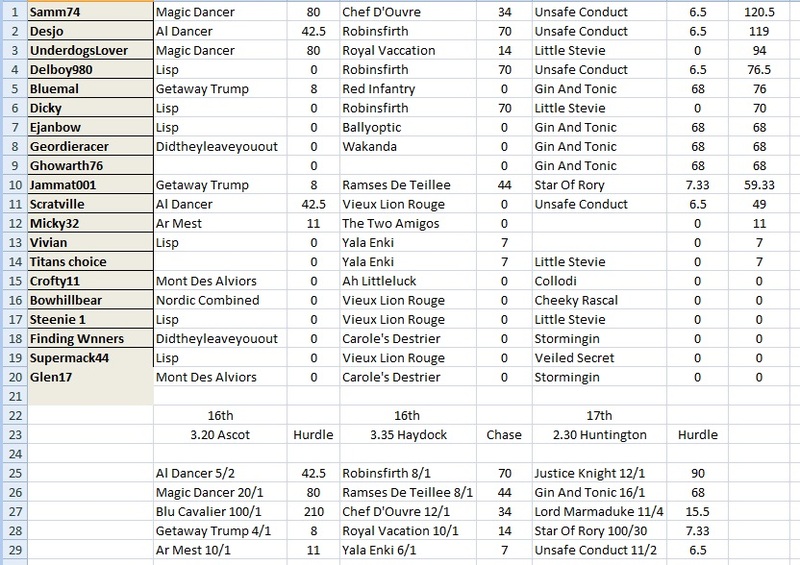 Welcome Desjo and Glen7 to the competition, I hope that you will carry on to the end of the race and not give up as points can be made by an occasional outsider coming in such as Blu Cavalier in the first race coming 3rd at 100/1. Only the top two had aq 100% SR these last three days. Vivian, we are having our second Christmas in June when my daughter comes home from Tajikstan where she is teaching English in the top school in the country where she teaches the Presidents grandaughters. Underdogslover and Samm74 hanging on to the lead but I have joined them in the two hundreds after selecting an 80/1 2nd place and yesterday's winner. The next three are not too far behind and could easily catch us. Well done to newcomer Glen17 after persevering and getting points on the board. Only Bowhillbear had a 100% SR on the four days. 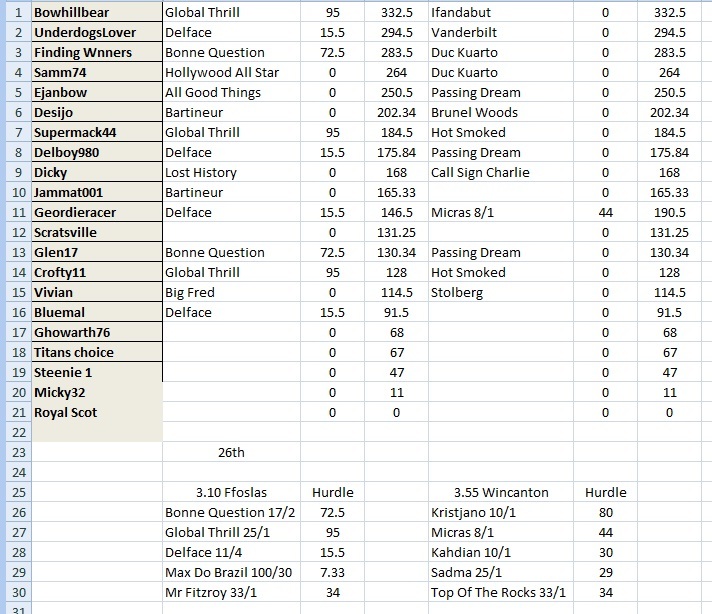 Well there is a big shake up in the top players with the lead changing to Bowhillbear, never underestimate him/her, Underdogslover dropping a place and Finding Winners has climbed to 3rd after both he, Bowhillbear and Glen17 picked today's winner and another two namely Supermack44 and Crofty11 selected today's big points. Only two days to go and I reckon any the top 6 have a chance of winning this race. 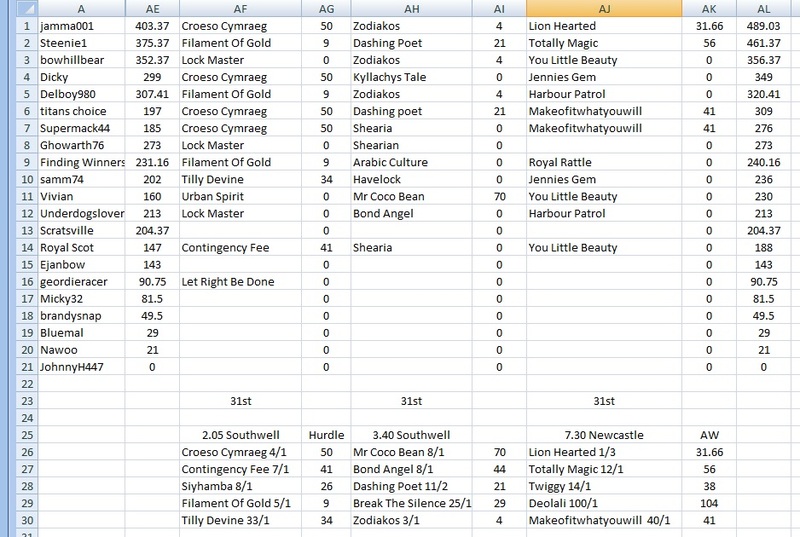 Well what a calamity today with only Geordieracer scoring with the second placed horse so no change at the top except that Bowhillbear has gained some points as for some strange reason I gave him the wrong horse so please keep an eye on your scores as old age does get in the way, well that is my excuse and I am sticking with it Last day tomorrow so it all out or nothing. 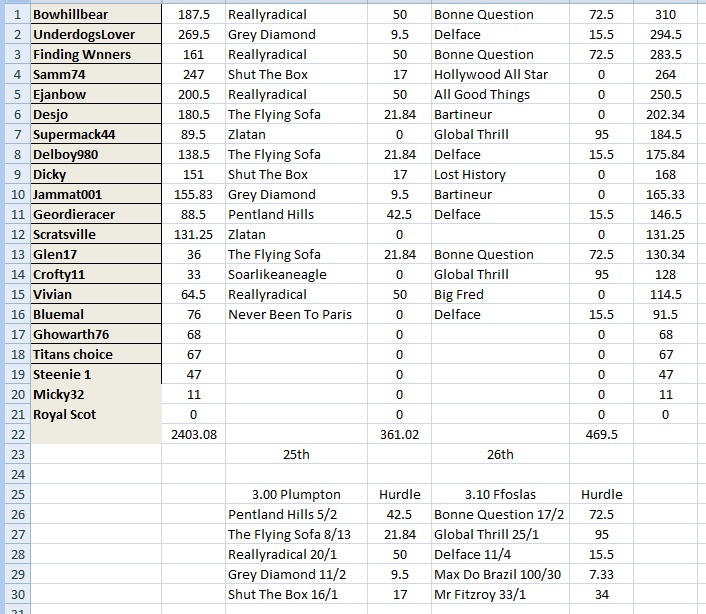 Well what an interesting month with the lead changing several time and congratulations and well done to Bowhillbear on winning the race and to Finding Winners who jumped past Underdogslover to come 2nd. Hope you all enjoyed the race. Last edited by ejanbow on Thu Feb 28, 2019 8:42 pm, edited 9 times in total. Well done to Jamma001 and to Steenie1 on winning this months second race with excellent scores both of them not far from that magic 500 points. Please accept my apologies for the delay in putting up the league but as you all know I have been indisposed. Good horse with strong course form, and has won two out of two over ‘chases at Haydock. One win was this race two years ago. Well handicapped today, cheek pieces worn which have helped before. Regular jockey Tom Scudamore booked to ride. He is a distance winner. Last 3 runs have ended in the frame, all, about the 2 miles. Today's jockey in the saddle and has won on him more than once. His wins have been on the softer ground, so the Good to Soft will suit. He has a raise in the handicap, which is to be expected, but not enough to cause concern. He is a C & D winner. Ran a good 3rd place LTO, Last two runs, after a long break, have been productive with both being in the frame. 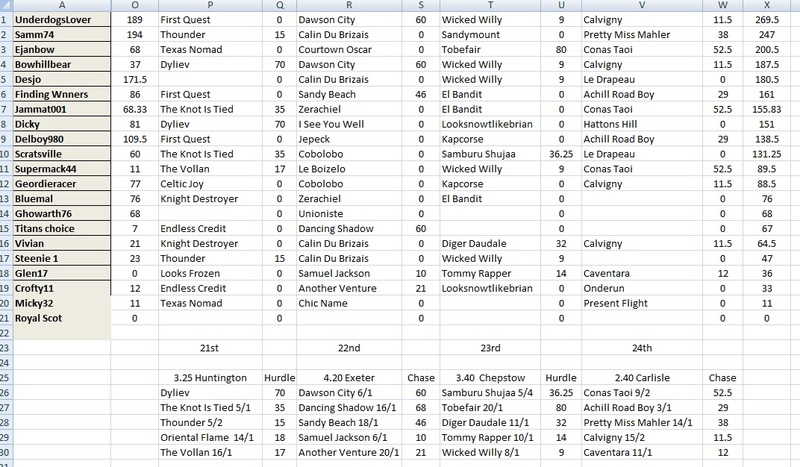 He only has a small raise in the handicap for his success, but has a very good 7lb claimer on board to counteract that. He runs well on the Good to Soft, so no worries with the going. He has a decent chance at a reasonable price. Could be anything judged on his three hurdle runs to date and the race he cruised to last time has had the form franked by most of those behind. Goes on any ground and this stiff track should suit. A race full of potential but this one arguably has the most and looks a solid favorite. Last win came in this race two years back off this mark, has been mostly running off marks in the 150's since but returned from a wind op with a really good run again off this mark over the National fences. His Chepstow run can be easily forgiven and can bounce back here at a double figure price. Double penalty did for him last time out and I don't think the handicapper has been over-harsh with the opening handicap mark. This is a very good looking renewal with the last 3 winners all taking part. Sue Smith's consistent chaser was below par when taking part in this 2 years ago but has 2 wins at Haydock under his belt and is worth supporting again here. Not over-punished for his last run when winning here over a shorter trip (Peter Marsh) and is a horse which is often overlooked in the reckoning by punters. Nicholls has a strong hand here and I am going for his apparent second string, this horse has run some nice races over hurdles, including a very good 4th off 137 in a valuable race at Ascot. He then had a break and came back over fences , then back to hurdles with a very good 3rd in listed race a Nse behind Lisp. He gave Lisp 2lb that day and with the Jockeys 5lb he receives 8lb from that horse today, the horse 4 and a half lengths back from those two has won twice since that race so the form looks OK. He is the second top rated horse in the race and the aforementioned 5lb allowance should make him competitive with the favourites in the race. Last time out he was sent off 5/1 favourite in a valuable race here , he was kept close to the pace that day and finished tired down the field, ridden with little more restraint today and he could well figure at the death. Two places in his 5 runs this term.. Carrying 10-3 claimer taken off -3. Was 2nd 8 at Kemp in class 3 on good. Has won on the soft.. Stepping up in class today. if copes with it!! Two places in his 3 runs this term. 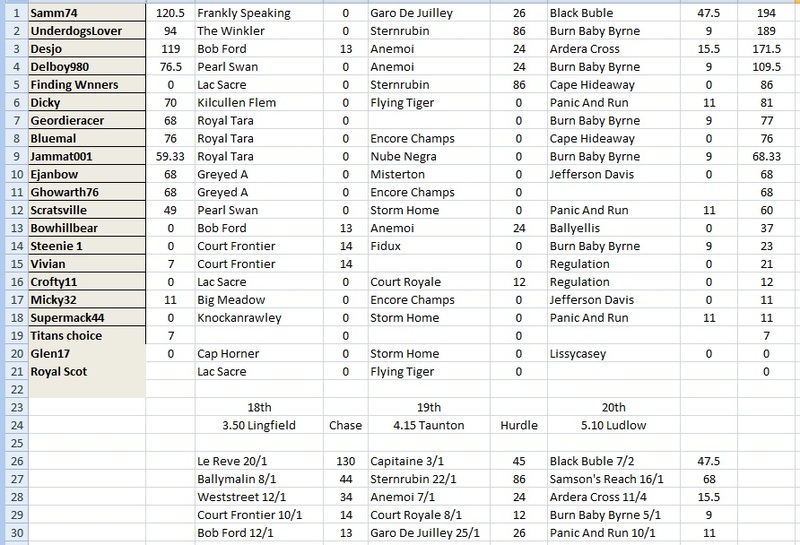 Won at Taun in mid Jan 7 run on gd st in 28f. Been placed in top class this season.